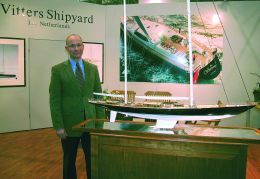 Among the shipyards involved in realizing superyacht, with particular regard to sailing, the Vitters Shipyard has acquired in relative short time a very high reputation. We wanted indeed to know the reasons why, apart from the mere analysis of the product yacht, asking the general manager to describe us briefly their activities and their future expectations. Since how many years Vitters Shipyard does build yachts and how many crafts have you up until now built? Since 1991 the shipyard builds crafts and has already produced 19 units of sailing and motoryachts. Is it always regarding custom - yachts or have you also built serial production yachts? It is always regarding custom-yachts, although we have already realized three crafts, which differ not only in fittings but also in basic features. We take care not only of the technical development but also with the realization of yachts, although sometimes we work in conjunction with external structures that we directly manage, so that they can comply our requirements. Could you give us a percentage of your total production divided into motoryachts and sailingyachts? Well, with regard to numbers it is easy to say that we have up until now built five motorboats and fourteen sailingyachts from 30'to 138' in length. What kind of customers have you? Above all our usual customers are Europeans, although some of them come from the United States. I say, these two areas are the most interesting for the production our yachts. Sure the European market is the most interesting one. What does imply for you the actual dollar-euro change situation and what about the future trend of new markets? Well, it is a problem indeed in that way the American market is actually very quiet, above all in comparison with two years ago and this is the reason why the European market is now the reference one. The East has a very important developing potential, but not so important for the sailing field. I think the Middle- East markets can in the future arise considerably, but only with regard to motoryachts. I think the Chinese market still needs more time in so far that certain passages can not be activated suddenly, although this trend seems actually to me to be impossible to stop. With regard to the Russian market it is always the same thing: this is an arising market indeed, but we have actually not yet Russian customers; we have only some contacts with them and this could be a somewhat sign: in the past we have had not even them. At the moment we have no Italian customers too. Would you say something about the last units produced and the crafts close to the end of building? 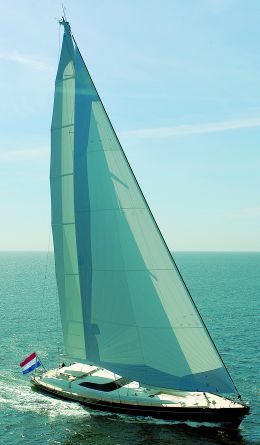 The last yacht we have launched is "Gimia", while the next one is "Ghost", a very fast, technological designed, light 120' in carbon fibre with all tricks adoptable to make her a very good performer. At our yard there is also another boat under construction, "Adele", a ketch, whose launching is set for half June. What is at the moment your production capability? Well, at the moment our production capability let us realize 1.5 yachts a year involving 60 employers and a lot of external workers. Actually we are working only at sailingyachts, but in the future we hope to receive orders also for light performing motoryachts, a very interesting segment. The 90 percent of our production yachts is in aluminium, while the rest is in carbon fibre, as "Ghost" for example is. Do you realize also rigging or does it come from outland? The most rigging parts either in carbon fibre or in aluminium come from New Zealand. It is very important to notice anyway that the new materials allow us to do something more than we could do in the past so that, in effort to realize performing but cruising oriented yachts, we can take advantages from using them. What is your best yacht, the boat you like above all? Well, there is no yachts I like above all; each of them has something particular I like in comparison with the other ones, something different that makes her a unique and, for this reason, not comparable with the others. Who is your greatest rival in building yachts? They are not few; sure Royal Huisman in Holland, Perini in Italy and Hallow Yachts in New Zealand. I think these are our greatest rivals in building yachts. Why do owners choose the Vitters Shipyard? Well, the reasons why could be different in some way, but I think our flexibility in realizing unique yachts in order to suit owners' requirements is an important element of it. We take a lot of care with detailing, we design interior in conjunction with working groups at total disposal of owners in effort to find the most suitable solution to the owner's requirements. At our yard there are no limits in designing yachts that could meet all owner's needs either in technical detailing or in aesthetical field, apart from the evidence we can provide any kind of high level consulting assistance either as shipyard or thanks to engineers and architects, with whom we daily work.